« How to get your kids into good colleges … without cheating or bribing. I expected the reverse of the math scores’ chart, but that’s not the case. (1) Scores for boys and girls have tracked closely together for the past 40 years … with boys consistently edging out the girls. Let’s cut the data another way: by self-identified race. 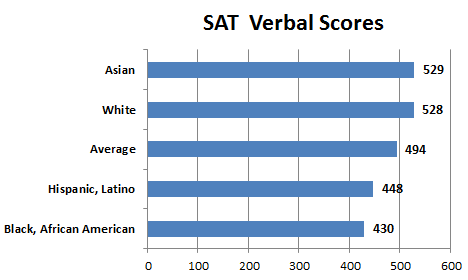 Most recent verbal SAT scores for Asian and white students are tied at roughly 529. Hispanics score about 15% below that level … and blacks score about 5% lower than Hispanics. 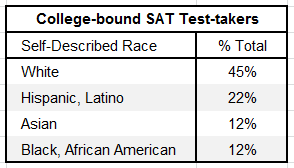 Technical note: Keep in mind, these scores are for college-bound SAT test-takers – not the broad population of all students, either in aggregate or for each category. The differences by self-identified race are even more pronounced in mathematics. As expected, Asian students led the pack at 602. 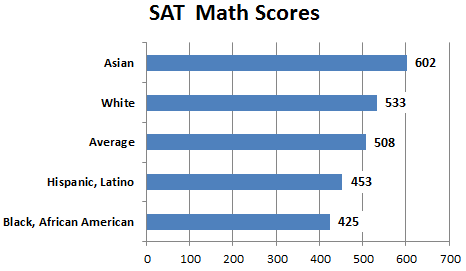 White students score about 12% lower than Asian students. Hispanic students score about 15% lower than white students … and black students score about 6% lower than Hispanic students. And, there are some noticeable trends by ethnicity. 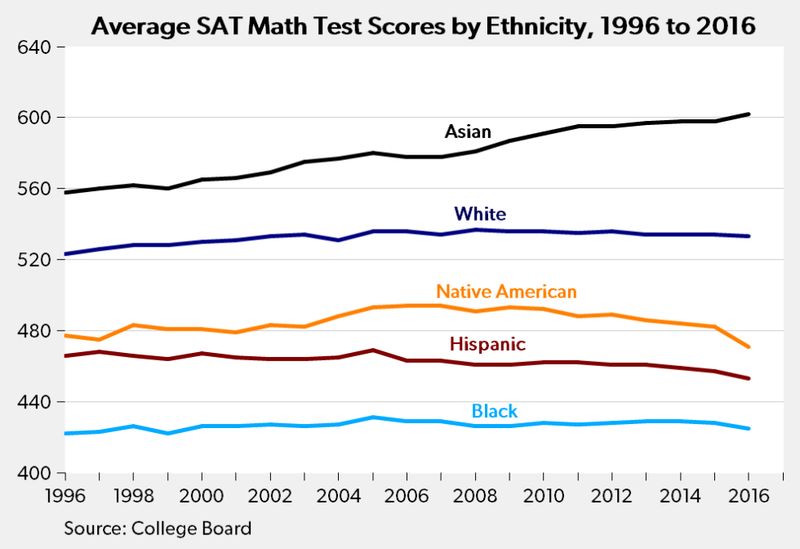 While White and Black math scores have stayed relatively flat the past 20 years (i.e. 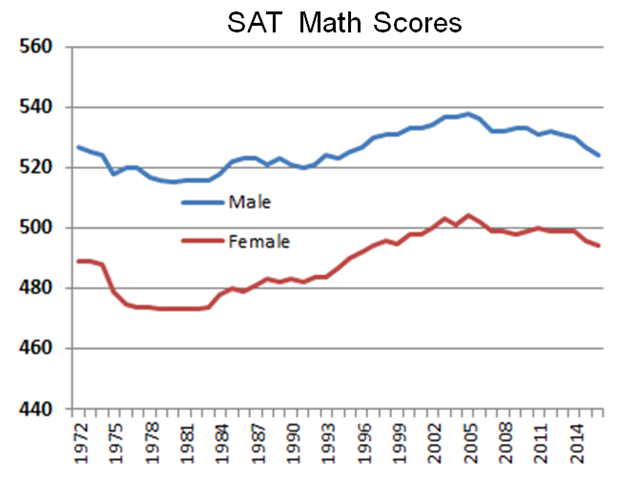 no improvement), math scores for Asians have trended steadily upward … widening the gap against other demographic groups. 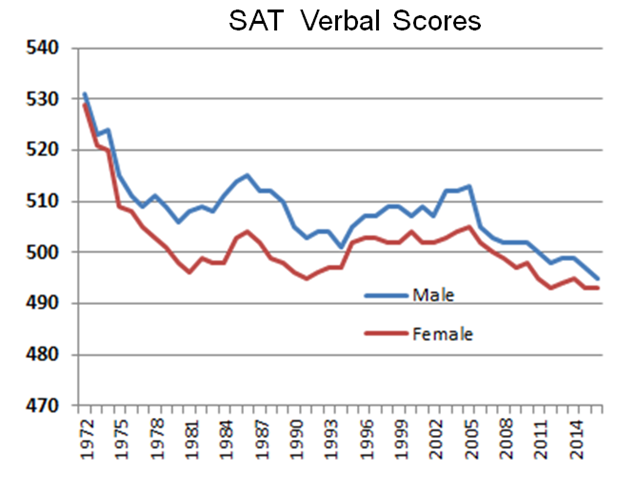 The other significant trend is a slow, steady decline in math scores for Hispanics …. who, at 22% of the total, are an increasing part of the test-taker “mix”. This entry was posted on March 21, 2019 at 6:59 am and is filed under Uncategorized. You can follow any responses to this entry through the RSS 2.0 feed. You can leave a response, or trackback from your own site.